The CEO's trip to Philadelphia and his expressing personal accountability were both important actions, say brand experts. Brand reputation experts said Starbucks has a narrow window of time to tamp down public outrage over the arrests of two black men at a Starbucks store on Thursday. Over the weekend, as viral video and accounts of the incident hit the internet, the hashtag #boycottstarbucks began circulating, and protesters convened on the Philadelphia Starbucks where the incident took place. “This is a very difficult situation for Starbucks. The company really has to move quickly to try to get ahead of it,” said Tim Calkins, clinical professor of marketing at Northwestern University. On Saturday, company CEO Kevin Johnson issued a lengthy statement apologizing for what he called the “disheartening situation… that led to a reprehensible outcome.” He flew to Philadelphia on Monday to meet with and apologize face-to-face to the two men. These were important first steps, but experts in brand reputation said the company would need to do more. “We live in such a highly charged time that incidents like this can really spark a much bigger controversy and can quickly become a major problem for a brand,” Calkins said. “That’s really important he didn’t let someone else take responsibility,” said Richard Levick, chairman and CEO of LEVICK Strategic Communications. “One of the ways to deflate a budding crisis is to apologize, say I’m sorry and mean it, and take responsibility, and Kevin Johnson has done that,” he said. Protesters charged the coffee giant with racial profiling after the two men were arrested for trespassing because they were waiting in the store for a third party without making a purchase — an activity many pointed out is hardly uncommon at Starbucks stores. Starbucks is no stranger to controversy, although previous calls for boycotts centered around its holiday cups or support of marriage equality have ultimately helped its brand identity. “What companies realized at that time is these threats of boycotts on the right have always failed to materialize in any meaningful, monetizing way,” Levick said. This time could be different, though. 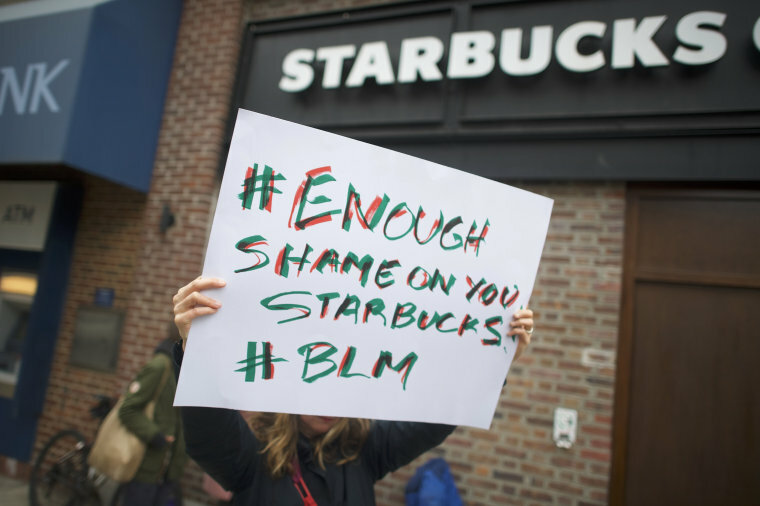 Brand marketing professionals point out that the accusations protesters are levying against Starbucks run counter to its stated values. Going forward, crisis PR experts say the company will have to demonstrate an ongoing commitment to fighting racial bias across all levels of its organization. “At this point, I think they’ve responded very well, but I think also they probably will now need to do more,” said Andrew Ward, an associate professor of management at Lehigh University. “The real issue for Starbucks is that this leads to a broader criticism of the company,” Calkins said. In his statement, Johnson said Starbucks would reevaluate its policies and address “unconscious bias” in employee training. Starbucks confirmed on Monday that the manager who had called the police no longer worked at that store. The company’s ubiquitous presence, high level of visibility and previous commitments to progressive causes mean the stakes are high for Starbucks to get this right. “I think Starbucks is sincerely sorry, but it should also take concrete steps and lead the way to turn this into a teachable moment,” said Marcia Horowitz, managing director at Rubenstein, a communications and reputation management firm. “It is a wake-up call,” she said.